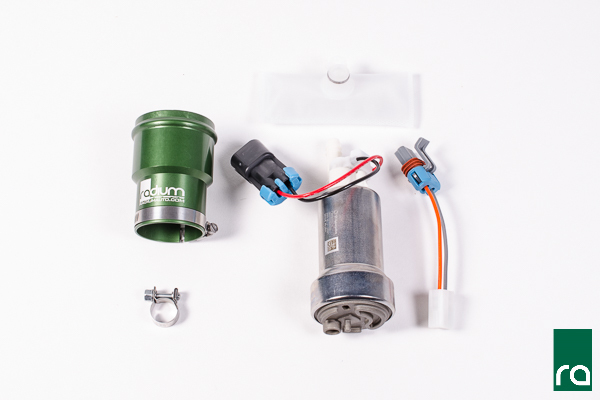 For those looking to increase the power output of their Porsche 911 Turbo (996), this plug and play (bolt-in) fuel pump replacement solution uses the most popular high performance fuel pumps on the market. 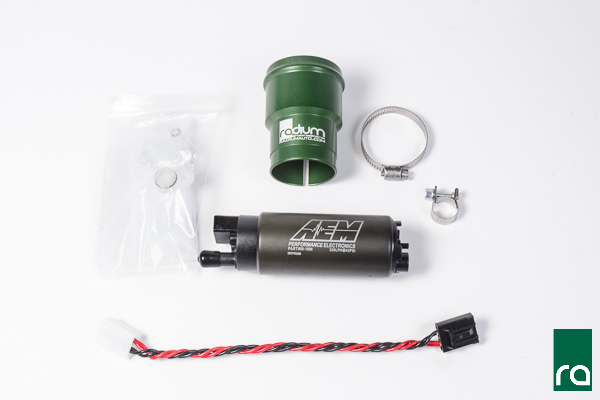 The basic kit features a 6061-T6 CNC billet aluminum sleeve that slides over the corresponding 39mm aftermarket pump to mimic the larger 50mm diameter of the Porsche fuel pump. 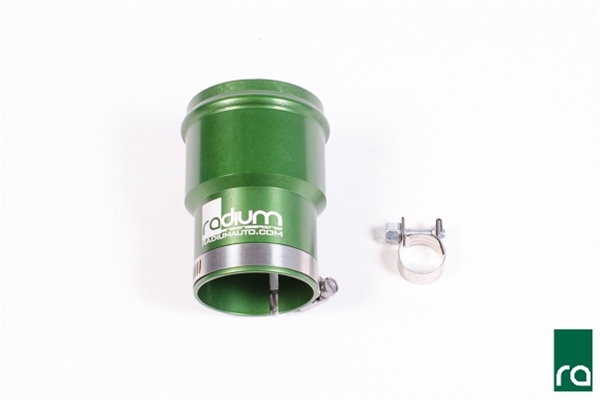 The machined rib snaps into the fuel pump hanger and properly locates the filter sock. For pumps not listed below, measure the outside diameter to ensure it is correct before ordering. If the pump is greater or less than 39mm, this kit may not work. 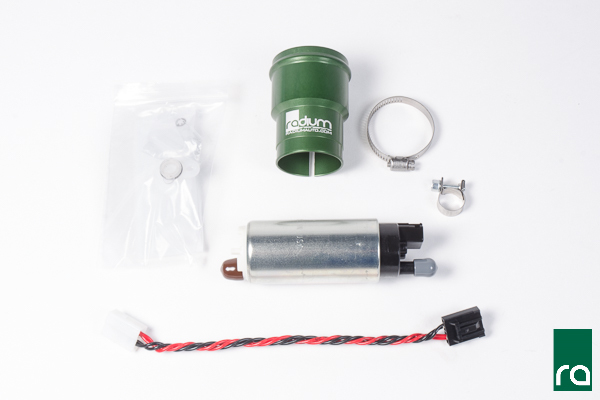 If an install kit with a fuel pump is purchased, a filter sock is included along with all necessary electrical components to make the kit plug and play, as shown below. 1. The Walbro F90000262 Gas Pump uses the same connectors as the OEM Porsche pump. 2. All pumps listed above outflow the Porsche pump, excluding Walbro 255LPH. However, if the OEM check valve (noted in instructions) is removed, it will outflow the OEM Porsche pump. 3. 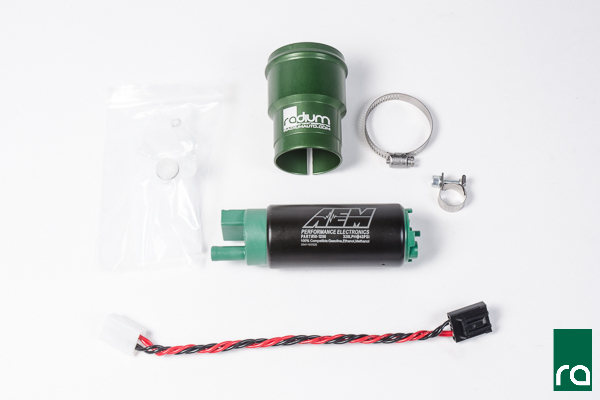 To fix any fuel starvation issues that are inherent with the OEM fuel tank system, we recommend using this product along with the Radium Fuel Surge Tank Kit. 4. No permanent modifications to the fuel system are required for installation of this product. 5. The OEM Porsche venturi jet pump system and level sender is all retained.